After last week’s back to back marathon weekend, the next week feels like it should be an easy week. That was this week, except it turned out to actually be a hard week just as it was planned. With fatigued legs, I never quite know whether I’m teetering on the tired side of the line or the injured side of the fine line. A few years ago I would have probably plowed ahead not listening and not respecting the distance and effort. Even now I still fall for my heart and not my head. But right now, I think I’m thinking clearly and I’m on the right track. I’m not quite at the point where I need to run, but I’m definitely on the I want to run and it’s a good feeling. I’m confident right now, but not overly so. 15 weeks until Bighorn 100. • What’s your most severe running injury? • Do you have a shakeout run or workout or distance? • What is your ‘A’ Race this year? After a big weekend of running back to back marathons and a necessary mandatory rest day on Monday, this shakeout run was just enough to get the blood flowing. At SBP I looked towards slightly harder routes maybe feeling a bit confident from the weekend. Didn’t send all of the routes, but they are within reach. Kind of how I feel like my running is at this point – optimistic. Nate and I glided through downtown Seattle looping our way back along the waterfront for a quick lunchtime run in beautiful blue sunny (but cold skies). Another little run with a dash of faster turnover helped moved the remaining lactic acid. Meant to finish up the remaining planned 5 miles after work, but got my self distracted as I’m sometimes wont to do between leaving work and coming home. Getting out the door was the hardest part of the run. I knew I had 11 miles to make up between Thursday and Friday, but I wasn’t sure how it would all break down. It was cold. It was dark. It was raining. And I really did not want to go. Kate pushed me out the door and I told myself at the 3 mile mark I’d decide whether to make the turn for just 6 miles or to keep going. I kept going. My legs felt like Pac-man, just eating up the miles. Looking back on it now, not sure if this means my form wasn’t good and my legs were too far out in front of me or if I just felt great. I’m going to go with ‘felt great’. This was an easy run and a hard run. Easy because there really was not much running, far more hiking. Hard because it took a long time, there was lots of snow and a decent lot of vert. 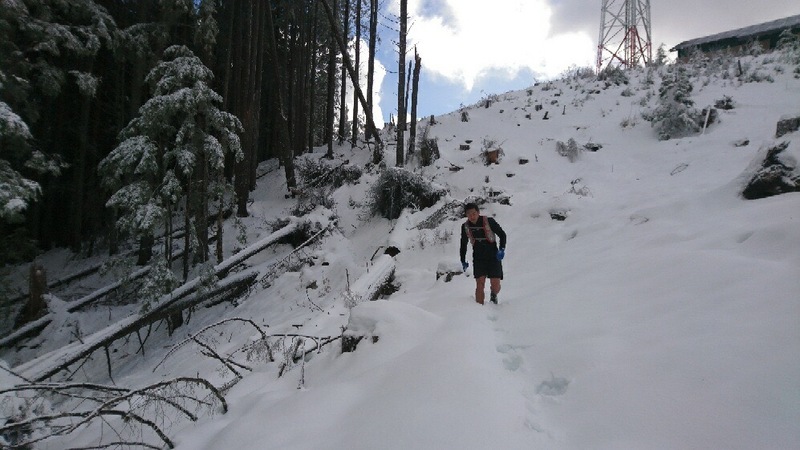 I dragged Mike out to Tiger Mountain not knowing there would be so much snow and it would be so hard and old and crusty and not really runnable and how hard it would be. On top of that we took on a decent amount of vert. Mike called it Stage 2 fun, which he described as not fun in the process, but looking back on it ‘could be’ considered fun and qualifies it as something you would do again. I’m inclined to agree. Having good trail company usually helps in my opinion. 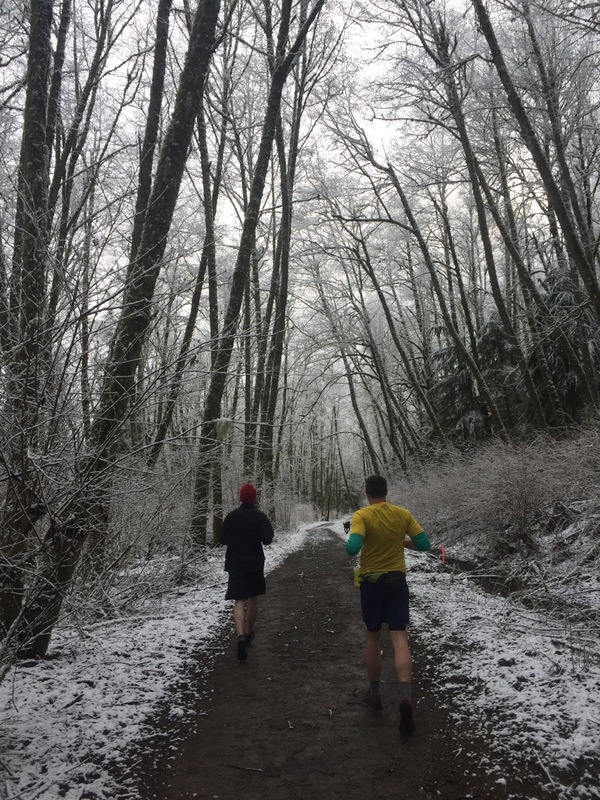 Drew, Dakota, Nate and I stalked our way through the early morning snowy trails with heavy legs (actually just me) and in awe of Mother Nature. The snow was pelted along only one side of every tree and every limb was frosted, glowing in the intermittent sunlight. Dakota stopped to sniff and then would blow by us on four paws showing us the way. By now, I’ve picked out a good rhythm for these weekend early morning runs. Pack everything the night before – a bag with a towel, an extra cotton long sleeve shirt for after the run, an extra water bottle full of water, my pack, a water bladder, fuel, a pair of gloves. Get breakfast ready. Lay out my clothes so I don’t have to search for it in the morning. Set the alarm for 30 minutes before it’s time to go. Text everyone to verify the meeting time and place. Go to bed earlier than I would on a work night (and wake up earlier than a work day). Repeat every Friday and Saturday night. It’s like clockwork. Only today I forgot my watch and my phone died because it was so cold out so we felt out the distance based on effort and time. 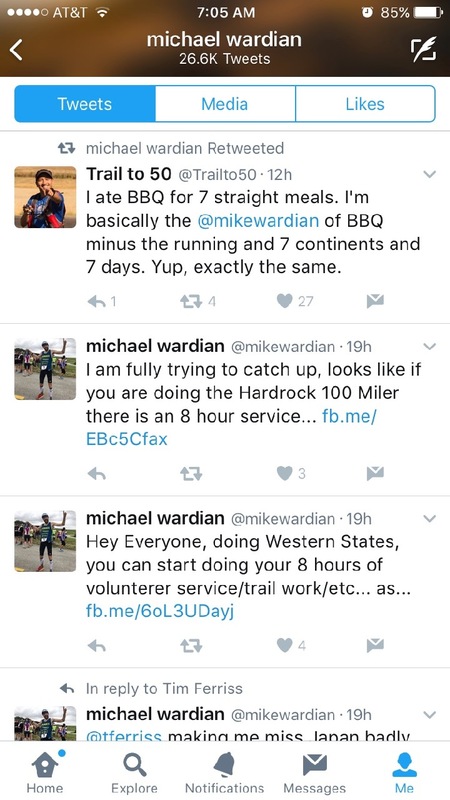 Oh yeah, by the way, Mike Wardian is a vegetarian. The view from Tiger 1 Summit. One of my favorite (of many) views and sections of the Tiger Mountain Trail. 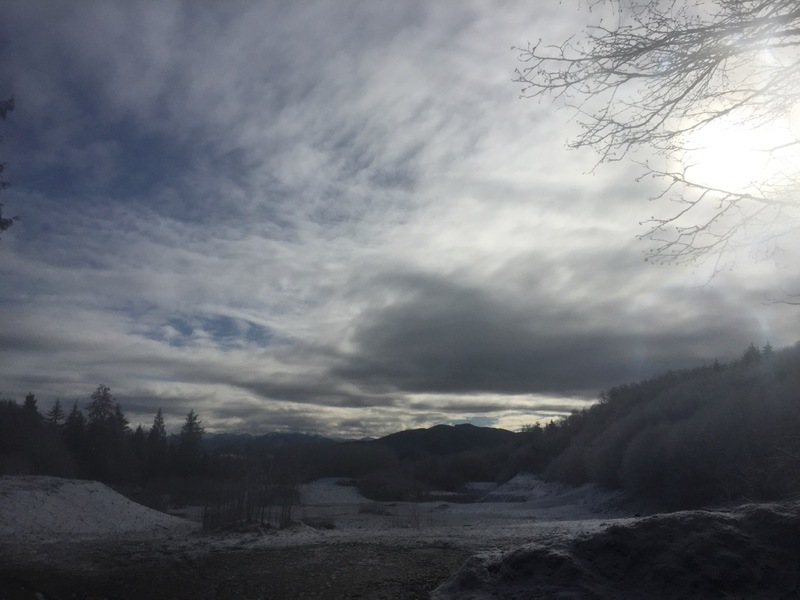 Everytime I am here I feel the need to take a photo – rain, fog, sun, or snow. Poo Poo Point south launch. 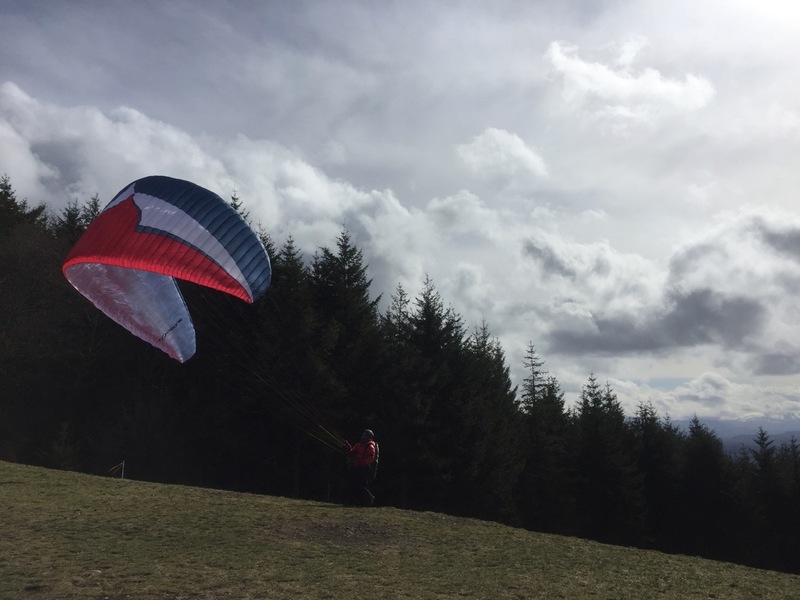 Paragliders were out in full force.